if this where an eMail form your bank or payment service to inform you on anything personal, why wouldn’t they inform you what it’s about straight away ? if you do a mouse-over on the URL in the eMail, a completely different URL is appears in a yellow highlighted line – now that’s about the best indication you could get that you’re being mislead ! Is it possible to (quickly) switch the language of the spelling check while I’m writing a message on my iPhone ? If I do so… will TimeMachine also backup the files from my 32GB USB-stick ? As always : to install this update, just use OSX’s built-in Software update feature (find it under the Apple-icon menu in the left top corner of your screen). 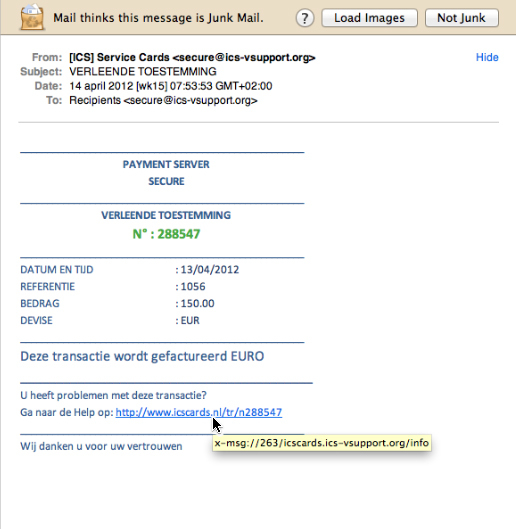 Beware : MAC Defender = malware ! don’t install ! remove it ! A program called “MAC Defender” claims to be your best protection, but do not install it ! If you really need a reliable virus-protection app for you Mac, go only with the renowned ones like Sophos, Kasperski, Norton, ClamXav or VirusBarrier (downloads available via MacUpdate.com, or from their respective brand’s websites). MAC Defender is a fake AntiVirus-app ! It’s a trojan horse intended for phishing your valuable data, passwords and credit card info. …but still : best remedy is not to install it at all !